Just popping on really quickly to say, “Hey!” and show you what I was working with yesterday. 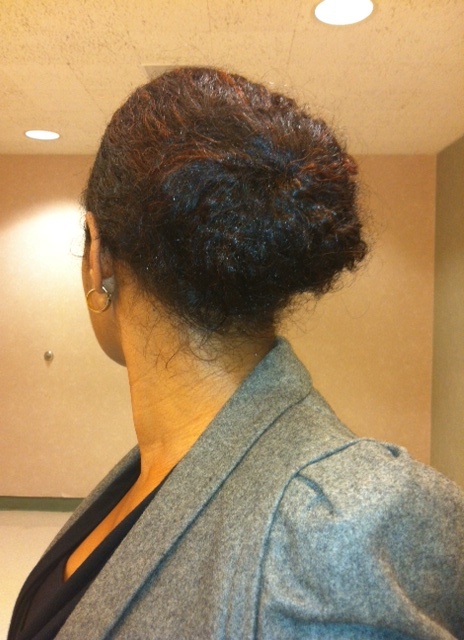 *lol* So, yeah, the basic boring, tame bun is back. But seriously, buns are soooo easy and work for me! I pulled back my hair and made a bun by wrapping the hair and securing with hair pins (I’m getting the hang of those now and prefer them over bobby pins as they don’t snag and yank out strands of my hair when removed). I didn’t use anything to secure my hair into a ponytial. NO elastic; NO banana clip. Then, I just mixed a little shea butter and Eco Styler Olive Oil gel to smooth my edges before tying down with a satin scarf for the drive to work. My hair is on its last leg now and needs to be washed this weekend though as it’s been two weeks since my last washing session. Now onto my “wild” outfit. LOL. It’s not really wild, but the title worked as the skirt is leopard. I am definitely getting my money’s worth out of this purchase. I honestly adore this skirt! It fits me like a glove and it’s just a great leopard print! 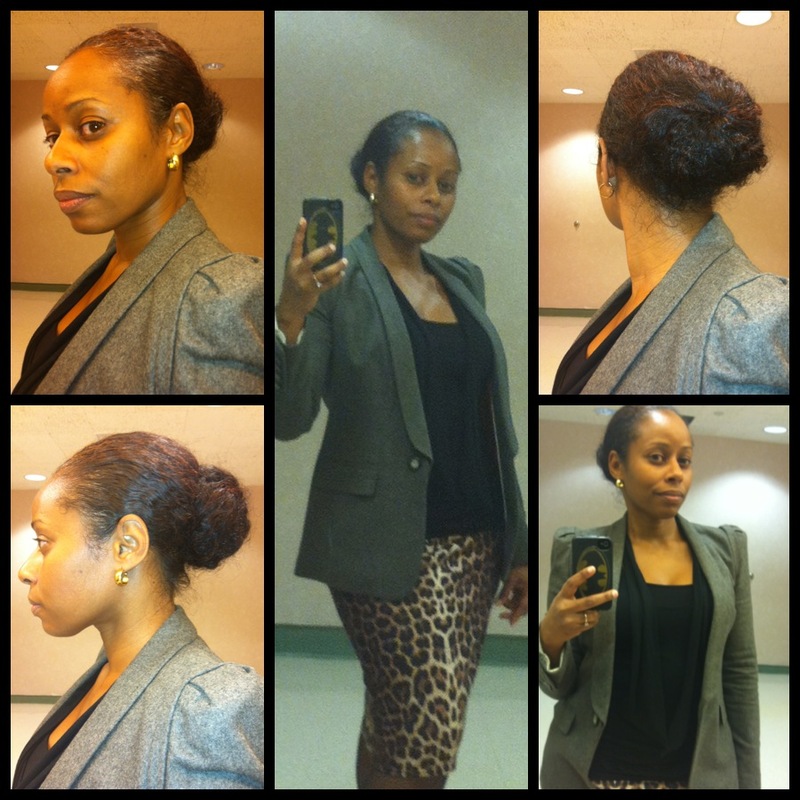 I paired it with another closet fave, a structured, grey, wool blazer that I picked up at Marshall’s in 2011. I love the details at the shoulders on this blazer, and the lean cut and lapels make it so sleek. I paired the skirt and blazer with a black, blouson tank with a tie-neck, but left the ties hanging so they almost look like an open men’s tie. I finished the look off with black fishnet stockings, black ankle booties and gold hoop earrings. I have a full length shot on my camera, but I’ll have to upload that to my computer and add it to the post later. Oh, and on another note, I made a new coconut oil body butter on Wednesday night!! It smells like chocolate!! I’ll share the recipe for this one soon. And, I plan on being a little mixtress this weekend too. Want to try a bentonite clay mask like I told you the other day and I also plan on trying my hand at making some flaxseed gel. I’ve made that before as well, but cooked the seeds too long, I think. So, the gel was too thick and viscous. Want to give it another go and see what it do ;). What do you have planned for MLK Day Weekend? Hey Shelli! Next time you find the gel too thick, just add some of your fav oils and essential oils and “whip” it and refrigerate it. It turns into a nice “gel cream” so to speak. I add 1 tsp of jojoba, 1 tblsp of coconut oil and a few drops of lavendar and vanilla eo. Or you can add a dollop of your body whip to it. I love that idea! I am going to steal it! I have had a bag of flax seeds in my fridge but have been scared to do it. Now that I know I can save it with a whip and some oils if I have a snafu, I am going to try it out! Thanks! I love the idea too!!! 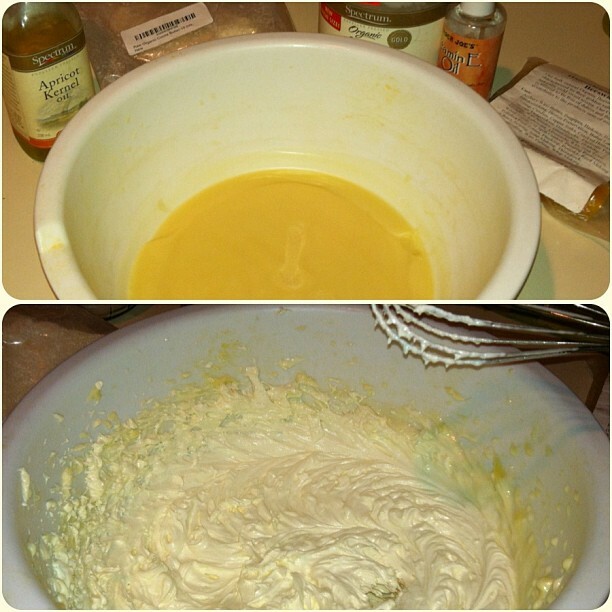 I’m not even waiting to see if my FSG is too thick, I’m making a whip!!! I’m just trying to figure out if I want to add shea butter to it too!! I am all on this!!! I can’t wait to see if this works!! Relaxing this weekend and church. Go running and sleep. I’m tired. Lol have a great weekend!